DZG’s Russian-named meerkats Oleg, Sergei, Mikhail and Aleksandr are all set for kick off later after their own World Cup warm-up. 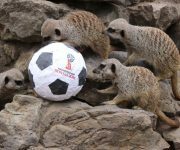 Keeper Josh Luxton popped a papier mâché ball, bearing the FIFA World Cup Russia 2018 logo, into the meerkat enclosure so the mischievous mammals could have a kick about ahead of the first whistle. Josh … Continue reading Feast of football!